A Thousand Words – Save A Woman – Save The World! Michaels niece had a birthday party last week and invited us to come and celebrate. Lauren is an amazing child – clever – well behaved – sweet – smart – kind – talented – beautiful on the inside and out. I mean, really…where does this kind of kid come from? The news always talks about school shootings and troubled teens holding up convenience stores. She is so not that. After our dramatic fallout with Dereks mom and adoptive father, we have had no contact with Derek and I thought it might be time to try again. I emailed Kim and asked her to allow Derek to attend his cousins birthday party and – after assuring her we were no longer having conversations with the “other side” – she agreed. 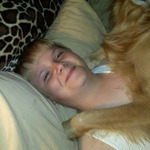 Michael picked him up and I met them at Laurens house. I still don’t trust myself around the ex-wife. Her blatant “moves” on Michael are still a bit of a sore spot and I don’t think it would be appropriate to yank her hair and smash her face into the side of a brick wall. Well – it might be appropriate but I don’t think it would serve to further a healthy relationship with Derek. However – I adore my brother and sister in law – and they find me amusing – and their children are such fun to be around – so I knew it would be a good time. We arrived and the party was already in full swing with Laurens mother, Susan, was making introductions and we were waiting for Michaels brother Steven to return from fetching the pizzas. Michael turned to Derek and joked “Do you remember being here before?” Derek looked a little stunned and then shook his head, looking a little confused. As Susan gave him the big “Susan Hug” Susan always gives people she likes (note to those of you who don’t get a hug) we told her – laughingly – that Derek didn’t remember the last time he was there. Susan didn’t even blink but gave him the big “Susan Laugh” and took him to a wall where – sure enough – there were several pictures of Michael and Derek from babyhood to Dereks 2nd Christmas. She pulled a framed Sears Photo 5 x 7 of Michael and Derek off of a shelf and handed it to him and we all went over to this huge leather sectional and sat down in front of a table loaded with photo albums. Susan is a semiprofessional photographer and snaps pictures of everything – especially of her kids – and has from the moment they were born. To say that Dereks curiosity had been aroused would be an understatement. Still holding the picture of him and Michael, he picked up photo album after photo album and saw himself playing in the very house where he now sat 10 years later. Having barbecue. Opening Christmas presents. Sitting on something reminiscent of a Big Wheel. Playing with his cousins. Obviously happy. Obviously loved. Obviously with Michael. Both Michael and I were a little unprepared for this, but we both had the good sense to just be quiet and let him process what he was seeing. He sat with us for a bit until we called him for pizza – and he reluctantly set the picture down. It only took about 15 minutes and an invitation to go play a video game before the consternation wore off and he was off. Before long he was playing and smiling and having a really great time. Derek has had a tough time since our first meeting in November. His adoptive father was always physically and emotionally absent and he has become increasingly abusive since the divorce. He lost his job and has pretty much spent everything he had and is in debt beyond anything he probably ever imagined. He hasn’t paid child support in months and we think he might be having some substance abuse problems which are precluding him from being able to get back up on the horse that threw him. His hatred for Kim – which I completely understand – consumes him and he is currently demanding full custody, blaming her for alienating him from his kids, drinking and driving with the kids in the car as well as insisting that Global Warming is her doing and that she is harboring Osama Bin Laden because he’s a great lover. Their violent bickering and obscene name calling frightens the children and of course they think all of the drama is their fault. Derek in particular – being in that awkward stage between a boy and a man – feels that he should “do something” and when he is with us he hates to leave and begs to stay. Police have been called to both of the residences and they text each other with mean and hateful threats. Of course Derek has been privy to much – if not all – of this behavior and the stress shows on his face. We got one of his school pictures and he just oozes anger and frustration. 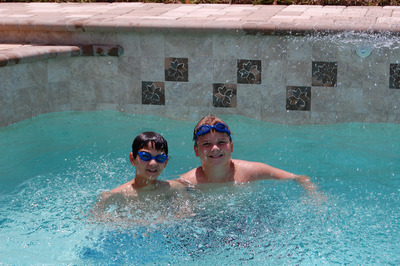 Today my sweet sister in law – Susan – sent me a picture of Derek and his cousin Marcus in the pool at the party. What a difference. Derek is smiling and happy and looks like a kid without a care in the world. A picture. It says a thousand words.